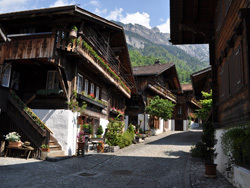 This picturesque village lies on the eastern, upper shore of the turquoise-hued Lake Brienz. It is famous for its romantic cobblestone-paved Brunngasse and a longstanding wood carving tradition, with wood carving and violin making schools. It is a starting point for excursions to the Ballenberg Open Air Museum, which gives visitors a taste of rural life in days gone by. Switzerland's oldest steam cogwheel railway huffs and puffs its way up to the 2,244 metre-high Brienz Rothorn peak with its breathtaking panoramic views of the Alps. 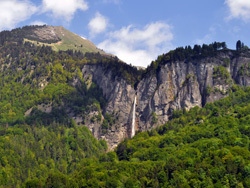 Attractions on the opposite lakeshore include the wild and romantic Giessbach waterfalls and Axalp, a family-friendly ski region in winter and popular hiking destination in summer. 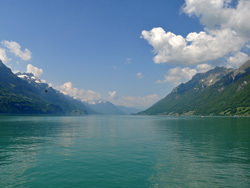 A leisurely stroll along Brienz' pretty traffic-free lake promenade with its small harbours, boat moorings and play areas is always a relaxing experience.